If you are an alternative lodging provider, i.e., bed & breakfast, cabin or cottage owner involved in furnished, short term rentals, please take a stand today! 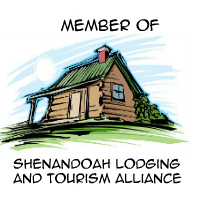 Affiliate memberships are available for those individuals, businesses and non-profits who benefit from tourism and would like to keep Shenandoah “Green”! If you are a traveler who prefers domestic lodging feel free to express your support as a Concerned Citizen. Membership is FREE! By signing up, you agree to be listed on the Our Members page. If you join as “Concerned Citizen” to protect your privacy you will not be listed. Fill out this form and hit the JOIN NOW button at the bottom. Then go to your email inbox and verify your intention to join. IMPORTANT: A confirmation email will go to you, to complete your registration please check your email inbox and verify your intent to join. Until you do this you will not be on our list. Help us keep the Welcome Mat out for tourism. Please show your support for our “green” cottage and cabin rentals! We will send you cool stuff and updates! Tourism is an intricate part of our economy. It brings in visitors to spend their money in our local shops, restaurants and attractions. Vacation rentals have become a multi-billion dollar industry that also collects tax dollars that are generated back into our communities. What is the problem? We had a great week here at your lodge. We drove from Chicago and met family that drove from New York City.The cabin was a perfect spot to relax and catch up--from the amazing view on deck to the fireplace to the Jacuzzi! We are so glad we found this rental and hope to one day be back!